The Bolshevik whose frantic rearguard actions during the fall campaign had often been given up, even when he was really having the best of it, merely because he always interpreted the persistence of American attack or stubbornness of defense to mean superior force. He had learned that the North Russian Expeditionary Force was really a pitifully small force, and that there was so much fussing at home in England and France and America about the justice and the methods of the expedition, that no large reinforcements need be expected. So the Bolsheviks on Armistice Day, 11 November, began their counter-offensive movement, which was to merge with their heavy winter campaign. So the battle of 11 November is included in the narrative of the winter defense of Toulgas. 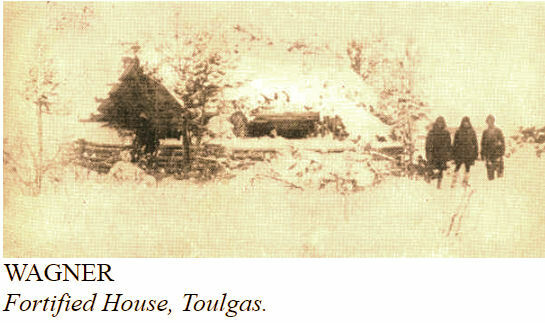 Toulgas was the duplicate of thousands of similar villages throughout this province. It consisted of a group of low, dirty log houses huddled together on a hill, sloping down to a broad plain, where was located another group of houses, known as Upper Toulgas. A small stream flowed between the two villages and nearly a mile to the rear was another group of buildings which was used for a hospital and where first aid was given to the wounded before evacuating them to Bereznik, 40 or 50 miles down the river. The forces engaged in the defense of this position consisted of several batteries of Canadian artillery, posted midway between the hospital and the main village. In addition to this "B" Company, American troops, and another company of Royal Scots were scattered in and about these positions. From the upper village back to the hospital stretched a good three miles, which of course meant that the troops in this position, numbering not more than five hundred were considerably scattered and separated. This detailed description of our position here is set forth so specifically in order that the reader may appreciate the attack which occurred during the early part of November. On the morning of 16 November, while some of the men were still engaged in eating their breakfasts and while the positions were only about half manned, suddenly from the forests surrounding the upper village, the enemy emerged in attack formation. Lt. Dennis engaged them for a short time and withdrew to our main line of defense. All hands were immediately mustered into position to repel this advancing wave of infantry. In the meantime, the Bolo [sic] attacked with about 500 men from our rear, having made a three day march through what had been reported as impassable swamp. He occupied our rearmost village, which was undefended, and attacked our hospital. This forward attack was merely a ruse to divert the attention of our troops in that direction, while the enemy directed his main assault at our rear and undefended positions for the purpose of gaining our artillery. Hundreds of the enemy appeared as if by magic from the forests, swarmed in upon the hospital village and immediately took possession. Immediately the hospital village was in their hands, the Bolo then commenced a desperate advance upon our guns. At the moment that this advance began, there were some 60 Canadian artillery men and one Company "B" sergeant with seven men and a Lewis gun. Due to the heroism and coolness of this handful of men, who at once opened fire with their Lewis guns, the advancing infantry was forced to pause momentarily. This brief halt gave the Canadians a chance to reverse their gun positions, swing them around, and open up with muzzle bursts upon the first wave of the assault, scarcely 50 yards away. It was but a moment until the hurricane of shrapnel was bursting among solid masses of advancing infantry, and under such murderous fire, the best disciplined troops and the most foolhardy could not long withstand. Certain it was that the advancing Bolo could not continue his advance. The Bolos were on our front, our right flank and our rear, we were entirely cut off from communication, and there were no reinforcements available. About 4:00 p. m. we launched a small counterattack under Lt. Dennis, which rolled up a line of snipers which had given us considerable annoyance. We then shelled the rear villages occupied by the Bolos, and they decamped. Meanwhile the Royal Scots, who had been formed for the counterattack, went forward also under the cover of the artillery, and the Bolo, or at least those few remaining, were driven back into the forests. been for the interference of a most remarkable woman, who was christened by the soldiers "Lady Olga." This woman, a striking and intelligent-appearing person, had formerly been a member of the famous Battalion of Death, and afterwards informed one of our interpreters that she had joined the Soviets out of pure love of adventure, wholly indifferent to the cause for which she exposed her life. She had fallen in love with Melochofski and had accompanied him with his troops through the trackless woods, sharing the lot of the common soldiers and enduring hardships that would have shaken the most vigorous man. With all her hardihood, however, there was still a touch of the eternal feminine, and when Melochofski issued orders for the slaughter of the invalided soldiers, she rushed forward and in no uncertain tones demanded that the order be countermanded and threatened to shoot the first Bolo who entered the hospital. She herself remained in the hospital while Melochofski with the balance of his troops went forward with the attack and where he himself was so mortally wounded that he lived only a few minutes after reaching her side. She eventually was sent to the hospital at the base and nursed there. Capt. Boyd states that he saw a letter which she wrote, unsolicited, to her former comrades, telling them that they should not believe the lies which their commissars told them, and that the Allies were fighting for the good of Russia. At daybreak the following day, five gun boats appeared around the bend of the river, just out of range of our three-inch artillery, and all day long their ten long-ranged guns pounded away at our positions, crashing great explosives upon our blockhouse, which guarded the bridge connecting the upper and middle village, while in the forests surrounding this position the Bolo infantry were lying in wait awaiting for a direct hit upon this strong point in order that they could rush the bridge and overwhelm us. Time after time exploding shells threw huge mounds of earth and debris into the loopholes of this blockhouse and all but demolished it. Here Sergeant Wallace performed a particularly brave act. The blockhouse of which he was in command was near a large straw pile. A shell hit near the straw and threw it in front of the loopholes. Wallace went out under machine-gun fire from close range, about 75 yards, and under heavy shelling, and removed the straw. The same thing happened a little later, and this time he was severely wounded. He was awarded the Distinguished Conduct Medal by the British. Private Bell was in this blockhouse when it was hit and all the occupants killed or badly wounded. Bell was badly gashed in the face but stuck with his Lewis gun until dark when he could be relieved, being the only one in the shattered blockhouse which held the bridge across the small stream separating us from the Bolos. For three days the gun boats pounded away and all night long there was the rattle and crack of the machine guns. No one slept. The little garrison was fast becoming exhausted. Men were hollow-eyed from weariness and so utterly tired that they were indifferent to the shrieking shells and all else. At this point of the siege, it was decided that our only salvation was a counterattack. In the forests near the upper village were a number of log huts, which the natives had used for charcoal kilns, but which had been converted by the enemy into observation posts and storehouses for machine guns and ammunition. His troops were lying in and about the woods surrounding these buildings. We decided to surprise this detachment in the woods, capture it if possible and make a great demonstration of an attack so as to give the enemy in the upper village the impression that we were receiving reinforcements and still fresh and ready for fighting. This maneuver succeeded far beyond our wildest expectations. Company "B," under command of Lt. John Cudahy, and one platoon of Company "D" under Lt. Derham, made the counter attack on the Bolo trenches. Just before dawn that morning the Americans filed through the forests and crept upon the enemy's observation posts before they were aware of any movement on our part. We then proceeded without any warning upon their main position. Taken as they were, completely by surprise, it was but a moment before they were in full rout, running panic-stricken in all directions, thinking that a regiment or division had followed upon them. We immediately set fire to these huts containing their ammunition, cartridges, etc., and the subsequent explosion that followed probably gave the enemy the impression that a terrific attack was pending. As we emerged from the woods and commenced the attack upon upper Toulgas we were fully expecting stiff resistance, for we knew that many of these houses concealed enemy guns. 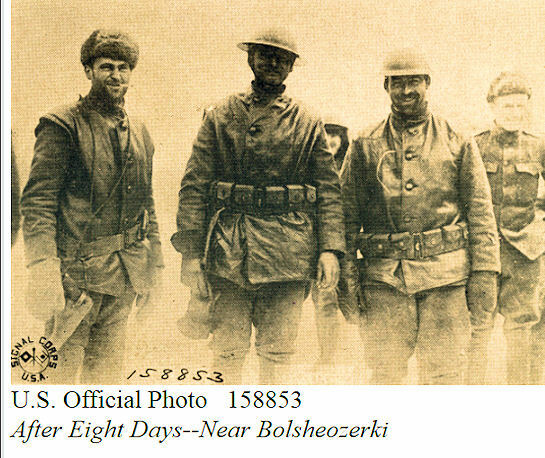 Our plans had succeeded so well, however, that no supporting fire from the upper village came and the snipers in the forward part of the village seeing themselves abandoned, threw their guns and came rushing forward shouting "tovarish, tovarish," meaning the same as the German "kamerad." As a matter of fact, in this motley crew of prisoners were a number of Germans and Austrians, who could scarcely speak a word of German and who were probably more than thankful to be taken prisoners and thus be relieved from active warfare. "We are in the two lowest villages—one steamer coming up river—perhaps reinforcements. 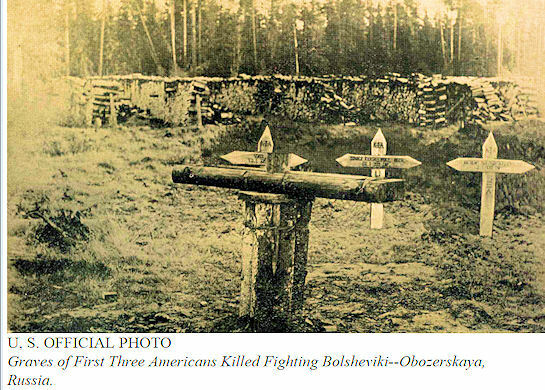 Attack more vigorously—Melochofski and Murafski are killed. If you do not attack, I cannot hold on and retreat is impossible. (Signed) FOUKES." Out of our force of about 600 Scots and Americans we had about 100 casualties, the Scots suffering worse than we. Our casualties were mostly sustained in the blockhouses, from the shelling. It was here that we lost Corporal Sabada and Sergeant Marriott, both of whom were fine soldiers and their loss was very keenly felt. Sabada's dying words were instructions to his squad to hold their position in the rear of their blockhouse which had been destroyed. 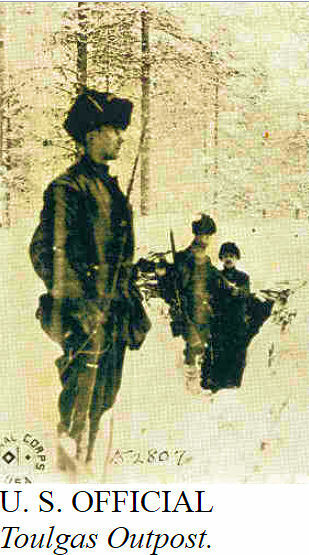 It was reported that Trotsky, the idol of the Red crowd, was present at the battle of Toulgas, but if he was there, he had little influence in checking the riotous retreat of his followers when they thought themselves flanked from the woods. 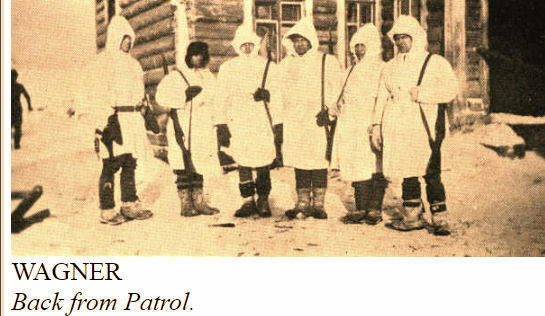 They fled in wild disorder from the upper village of Toulgas and for days thereafter in villages far to our rear, various members of this force straggled in, half crazed by starvation and exposure and more than willing to abandon the Soviet cause. For weeks the enemy left the Americans severely alone. Toulgas was held.
" 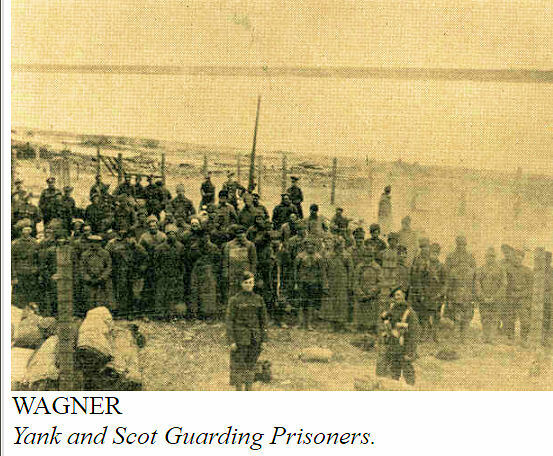 in this motley crew of prisoners were a number of Germans and Austrians, who could scarcely speak a word of German" - I think they mean "Russian." Or these are prisoners from Austria-Hungary and of non-German-speaking ethnicities. What an account! I need to grab a copy of this book. PS: as a denizen of the north country I am very envious of the plentiful wood piles seen in the final photo. 100 Years Ago: Whither Alsace and Lorraine?